Tokyo Electric Power Co.’s stricken Fukushima No. 1 power plant has released rainwater tainted with radioactive substances into the Pacific Ocean at least seven times since April. The Fukushima Prefectural Government, pressured by worried residents and fishermen, has pressed the Nuclear Regulation Authority to set maximum radiation limits for rainwater releases, but the regulator hasn’t acted yet, citing the lack of specific laws on radioactive rainwater. 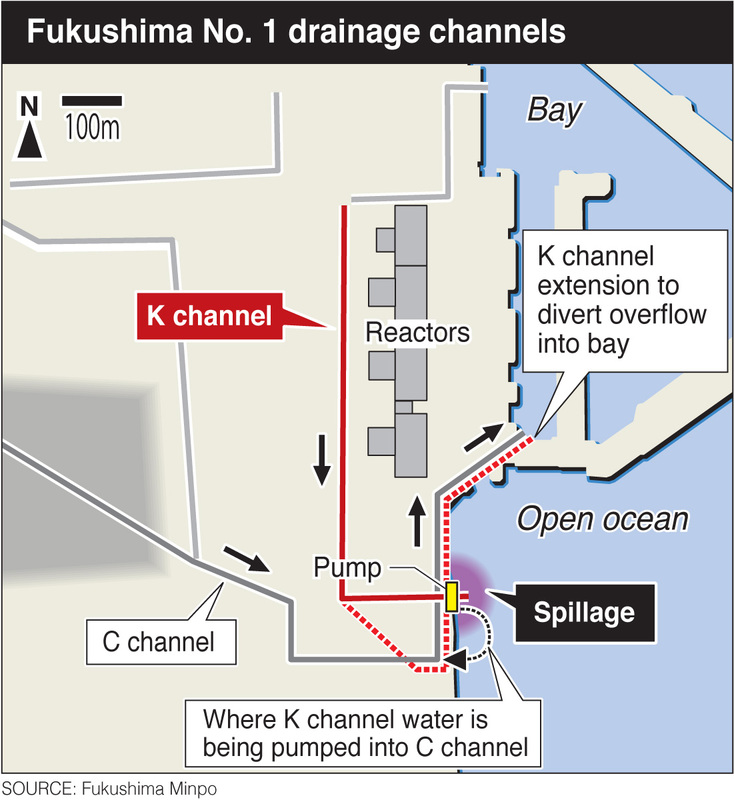 The plant’s K channel, a gutter that was built to drain rainwater accumulated around the six reactors, leads directly to the sea. 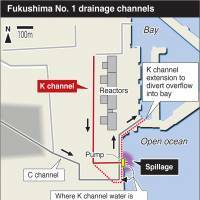 After rainwater was found tainted with radiation in April, Tepco, as a temporary fix, installed eight pumps and a special underwater curtain in its artificial bay to segregate the water from the open ocean. With the pumps and the curtain, Tepco claims it can keep radioactive runoff within the bay as long as the rainfall stays at 14 mm per hour or less. But on Aug. 17, rainfall at the plant exceeded 18 mm per hour, and some untreated rainwater overflowed the K channel and got into the ocean. The same thing happened again on Sept. 9 and 11, amid flooding in the Kanto and Tohoku regions triggered by Typhoon Etau. When the drainage system is overwhelmed by heavy rain, it is difficult to measure the tainted water and its radiation level, the utility said. In May 2014, when Tepco succeeded in measuring rainwater on the premises, the cesium-137 level was gauged at 770 becquerels per liter, or over eight times the 90-becquerel limit for water the plant can release into the sea. To rectify the situation, Tepco has been trying to change the K gutter’s path so it will flow into the artificial bay instead. But the rerouting work will take until March 2016. While Tepco says the problem will be solved in six months, prefectural officials are demanding Tepco resolve the problem as soon as possible, because if the leaks are allowed to continue throughout the typhoon season, public distrust in the government will deepen, making the decommissioning process even more difficult. Fishery officials are meanwhile worried that their industry could be damaged further if the unregulated rainwater releases continue. The prefecture is specifically asking that a new pump be installed close to the source of the tainted rainwater, but Tepco has been reluctant, saying such a pump is structurally impossible to install because the part of the drainage system where tainted water is leaking from is underground. Tepco has been cleaning the drainage gutters on a regular basis to reduce the radiation levels, but to no avail. Kiyoshi Takasaka, a prefectural expert on atomic power, wants the NRA to place radiation limits on rainwater immediately. However, the NRA’s position is that there are no laws that regulate radiation-tainted rainwater and therefore it cannot set numerical limits. One industry source said doing so would require revisions to existing laws, which will take a lot of time. This section, appearing every third Monday, features topics and issues covered by the Fukushima Minpo, the largest newspaper in Fukushima Prefecture. The original article was published on Sept. 13.